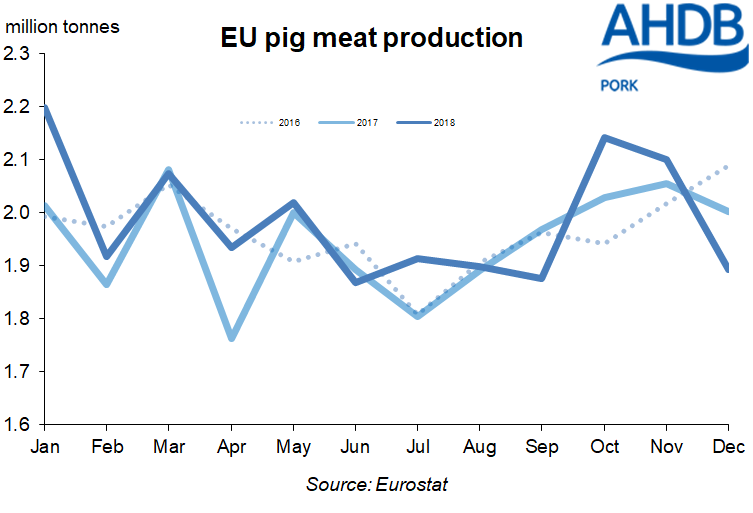 EU pig meat production for December was down 5% compared to December 2017, according to the latest figures from Eurostat. The data revealed that, cumulatively, overall 2018 production still went up by 2% to 23.8 million tonnes, with throughput also up 2%. This was mainly the result of strong growth in the first half of the year, with good profitability in 2017 encouraging expanding sow numbers. 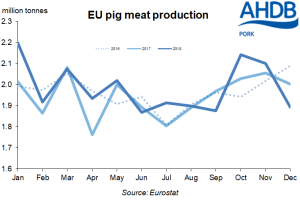 However, pig meat production in the second half of the year was more in line with 2017 levels. AHDB analyst Jennie Tanner said that output may now fall little in the first half of 2019, based on recent census results. Ms Tanner said: “Unlike in 2017, last year the majority of member states increased production. Spain (the second largest producer) increased production a further 5%, following a 3% increase in 2017. Poland and the Netherlands also both showed 5% increases in production. The Polish industry has been supported by increased imports of weaners and slaughter pigs. Meanwhile, Danish production increased 3%, following two years of decline, despite continuing growth in weaner exports.